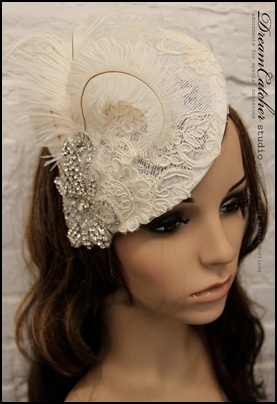 We are fascinated with fabulous bridal fascinators! 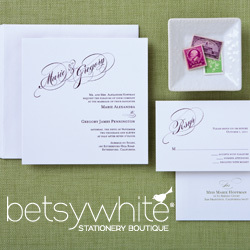 With their recent growth in popularity, there is a design available to compliment any bridal gown. Accents of crystals, feathers, flowers and more adorn these beautiful accessories. Many brides choose to incorporate a bird cage veil which is easily removable after the ceremony has ended. We’ve searched to find some of our favorite designs from vintage to contemporary. Vintage meets contemporary with this stunning design from Ice Green Eyes. Custom crafted, this design features a large crystal embellishment surrounded by white and off white ostrich feathers with a bird cage veil. 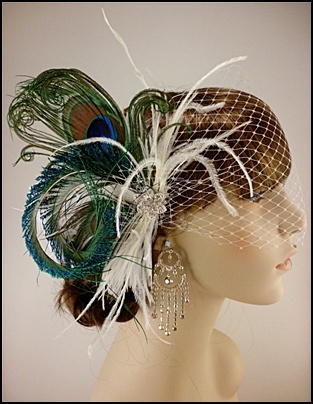 Pops of color in green and blues are featured with peacock feathers. 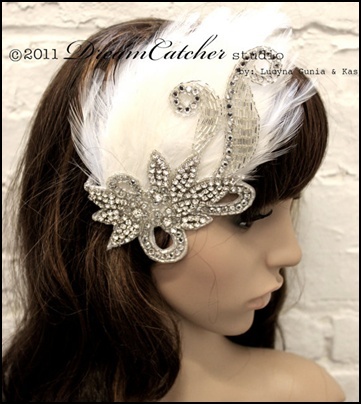 A touch of feathers and Hollywood Glam inspired this design from Dream Catchers Studio. Gorgeous feathers are accented with various size Swavorski Crystals and exquisite beading. So vintage chic! This design features an Alencon Lace base accented with ivory ostrich feathers and a crystal beaded appliqué. Optional Russian Bird Cage veil is available to complete this vintage inspiration. Designed by Dream Catchers Studio. Planning a tropical or beach theme wedding? Or perhaps you just love tropical flowers? 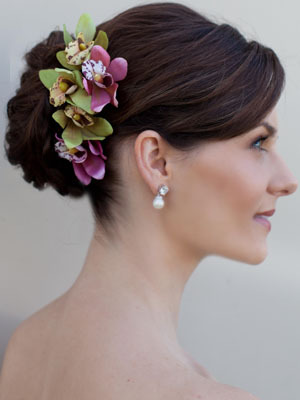 We love this design also from HairComesTheBride.com where you can find a large colorful assortment of tropical floral hairpins to create your own custom color fascinator. Dreaming Of A California Beach Wedding?